In the midst of Mental Health Awareness Month, this campaign will advocate for new treatment and advocacy needed for those living with mental illnesses, as well as help to break down stereotypes and misconceptions associated with these disorders. As a result, we will encourage those to seek help and support and make mental health less of a taboo topic, thus increasing the quality of life for people living with mental illnesses. In the U.S. today nearly 1 in 25 (10 million) adults and about 1 in 5 children aged 13-18 live with a serious mental illness. Among the most prevalent mental illnesses found in Americans are major depression, bipolar disorder, schizophrenia and anxiety disorders. These illnesses impact a person's thinking, feeling or mood and may affect his or her ability to relate to others and function on a daily basis. The print component of “Mental Health” is distributed within today’s edition of USA Today in New York, Los Angeles, Chicago and Washington DC/Baltimore, with a circulation of approximately 250,000 copies and an estimated readership of 750,000. The digital component is distributed nationally, through a vast social media strategy, and across a network of top news sites and partner outlets. To explore the digital version of the campaign, click here. 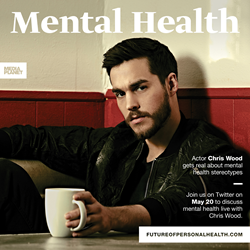 CW TV Star Chris Wood graces the cover of the print publication. Through an exclusive interview on the interior, Wood opens up about his father’s passing as a result of untreated mental illness and gets real about breaking down stigma attached to mental health. “I want us to get to a place where we are all comfortable enough to admit when we have a problem,” he says. “And for those around us to encourage nothing but seeking a solution. This campaign was made possible with the support of Mental Health America, National Alliance on Mental Illness, Anxiety & Depression Association of America, Iraq & Afghanistan Veterans of America, American Foundation for Suicide Prevention, Janssen, AstraZeneca, Argosy University, Give an Hour and Hope for Warriors.